Sunday 16th August saw a small traffic jam outside the gates of Lytham Hall but not the usual traffic jam one would see in Lytham as the looks on the other motorist's faces testified to. Lined up outside the elegant gated entrance were a selection of Vietnam era military vehicles waiting to be allowed into the grounds prior to the arrival of 509. 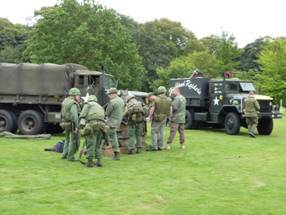 Richard Clegg had driven over from Yorkshire in his Reo cargo truck, Alun Thomas had brought his replica gun truck 'Highland Raiders' from Warrington, David McCoull arrived in his Reo which used to be owned by Mark and Judith who came along in their jeep. Jo and Nina had driven to the Hall in the Mutt and I had driven 'chuck' the motorhome. We had also invited along Arthur Roe of Help for Heroes who was accompanied by his daughter. We had met another volunteer at Woodvale a couple of weeks earlier and he put us in touch with Arthur. Keen to help ex-servicemen organisations we thought it was a good opportunity for the Help the Heroes’ local representative to see what we get up to and what we might be able to offer to support them. Once into the grounds all the vehicles were kept parked on the hard standing whilst waiting for the arrival of 509. 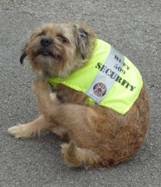 I parked the motorhome off to one side of the Hall whilst Jo set off in the Mutt to go and pick up Taggart (509's head of security). As per Ground Crew standard responsibilities I walked the front lawn just to make sure there were no loose objects that could cause a problem if caught up in the downwash upon Huey’s arrival. All was clear and at 12.10 pm I got a call from Neil to say that he, Phil and Bradley were strapped in and ready to press the button. This told us they would be ready to put down on the lawn a little before the 12.30 deadline. 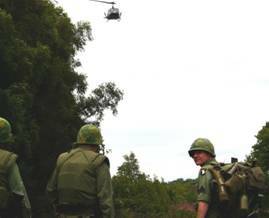 After a cautionary word with those on site with regards to the cut grass being thrown around, many found a suitable vantage point to watch the approach of Huey. Lessons had been learnt from last year and video cameras were placed up against immovable objects so as not to have the shaky shots when the downdraught hit them. Even those wanting to take photos braced themselves or knelt down. As the anticipation gained, Jo, Nina, Mark and Judith donned their hi-vis jackets and went to the far points of the Landing Zone to make sure that there wasn't anyone in these areas of grounds that might cause a problem to the approaching helicopter. Happy all was clear they returned to monitor the forward perimeter. A few minutes later a couple appeared at the far end of the lawn with a black Labrador; it transpired that it was a 7 month old pup being trained as a Guide Dog for the Blind. They moved off the lawn and decided to stay and watch and let the Labrador experience something new and to see how she reacted to this strange machine descending from the sky. 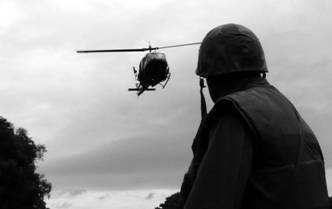 Shortly before 12.25 I caught the sound of the Huey in the distance. It wasn't long before 509 swung into view above the trees directly in front of the Hall. The sound was deafening as she made a flypast to prepare for the landing. Phil swung her round to the north and then round to the east and then the final turn to the west to line her up for her approach on to the lawn. To land in front of the Hall requires a relatively high approach to then drop down once past the trees and the end of the lawn. I guided him down to a similar spot to the previous year leaving room for the vehicles to park up on either side of the helicopter. Phil, Neil and Bradley prepared to shut the Huey down whilst those on the ground gathered themselves up from the battering they had just been subjected to of five tons of air displaced by the descending 509 (no-one was complaining though). 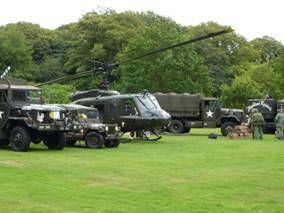 Rotors secured, the vehicles moved on to the grass and the guys started to unload their equipment to set up small displays. Although a little breezy to say the least the sun did come out for a while. The awning was wound out on the motorhome and a selection of Huey items for sale from the shop was displayed. 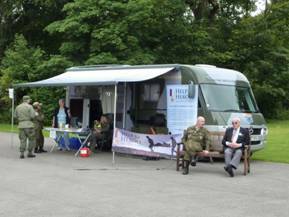 Arthur produced his Help the Heroes banner etc which we set up alongside the motorhome. 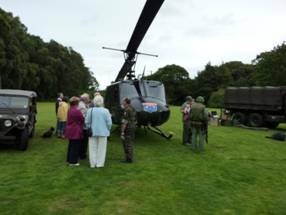 There was a steady trickle of people throughout the afternoon to look at the Huey and to visit the Hall, many giving generously to the Help for Heroes collection tins and also to buy items from the Huey shop. As always with these events no sooner had we arrived and it was time to pack up and wend our way home. 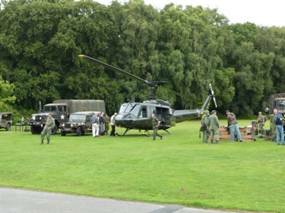 The vehicles cleared the lawn and Neil and Phil wound Huey up and lifted noisily in to sky above the picturesque Hall before nosing 509 to fly off to Wesham. The Reo's formed up in line and with their distinctive whistling exhaust note they headed off blaring on their horns. That was an impressive sight. We too headed off with the Mutt, the jeep and the motorhome back to Wesham for tea. It was a very pleasant afternoon and an enjoyable drive through the Lancashire countryside. 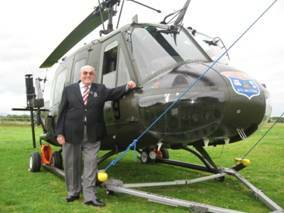 As we pulled into the yard the Huey was already on its ground handling wheels and being towed back under cover using the jeep. 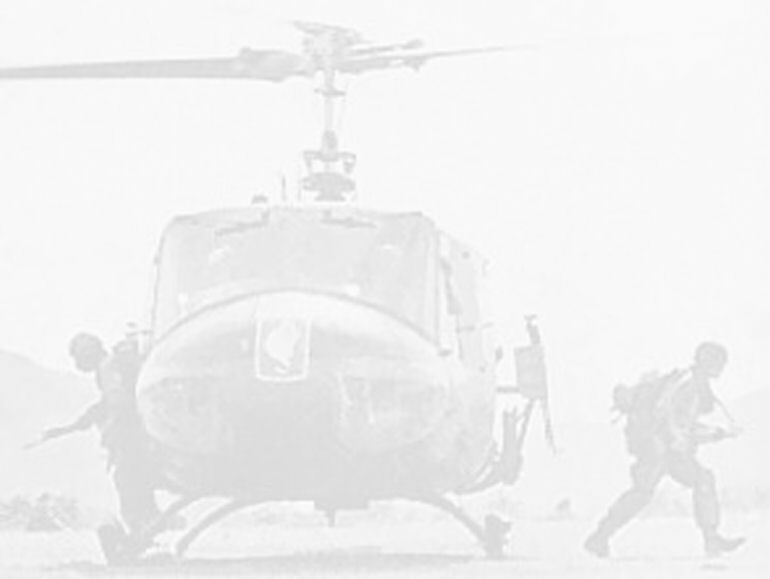 Once inside, the jeep was disconnected and the Huey pushed by willing hands inside just a little further to allow the door to be closed. After a drink and a natter we all headed indoors for a delicious Lasagne made by Jo. An excellent evening followed as we relaxed after the fourth weekend on the trot we had being doing something Huey related. Here's to the next time.